The community of Clinton, Illinois overwhelmingly passed a bond referendum five years ago to build a new elementary school for its Unit School District 15. More than 70% of voters favored the bond proposal. The main program challenge for Clinton's new Elementary School, and the one that has also yielded the greatest benefits, was: How could Clinton's two existing, separate elementary schools be merged? Previously, elementary grades 2 and 3 were taught in a separate building from grades 4 and 5. To best use resources, merging shareable facilities and staff in a single building made sense. Yet blending these two populations, with their independent cultures that had grown apart over the years, posed significant challenges. Though both schools shared many similarities such as curriculum, guidelines and district policies, there were many differences in how each individual school operated. Achieving a design that met this and other community requirements was an intense yet fun collaborative process. Clinton is a close-knit, rural community. Cordogan Clark & Associates worked as both architect and construction manager to ensure an enjoyable process through every step. Initially, we reviewed several options, including maintaining the previous two elementary schools. After careful review, the community determined the existing facilities had reached the end of their useful service lives, the 90+ year old buildings were not conducive to 21st century learning standards, and that appropriate renovations would cost more than new construction. With additional design charrettes, we blended seemingly conflicting demands to create a cohesive yet vibrant design that suits the diverse needs of grades 2 thru 5. The new building also houses a wide variety of community functions throughout the year, and had to be designed to meet the needs of these as well. At the outset of the design process, our design team, school administrators, and the school district reviewed several potential sites, weighing options based on driving distance, bussing, and future growth. With contributions from the community, the administration and board of education chose the site closest to the existing high school and middle school. By placing the new elementary school near these other two schools, Clinton created a 'District Campus' that best enhances the ability to share resources for multiple grade levels. Clinton Elementary School is designed to meet current 21st Century Education Environment needs, and to adapt and evolve as these needs change. The project included the construction of a new 72,000 square foot elementary school and the remodeling of the high school. Clinton Elementary is designed with young learners in in mind. It visually connects to the outdoors, and provides generous natural light throughout. 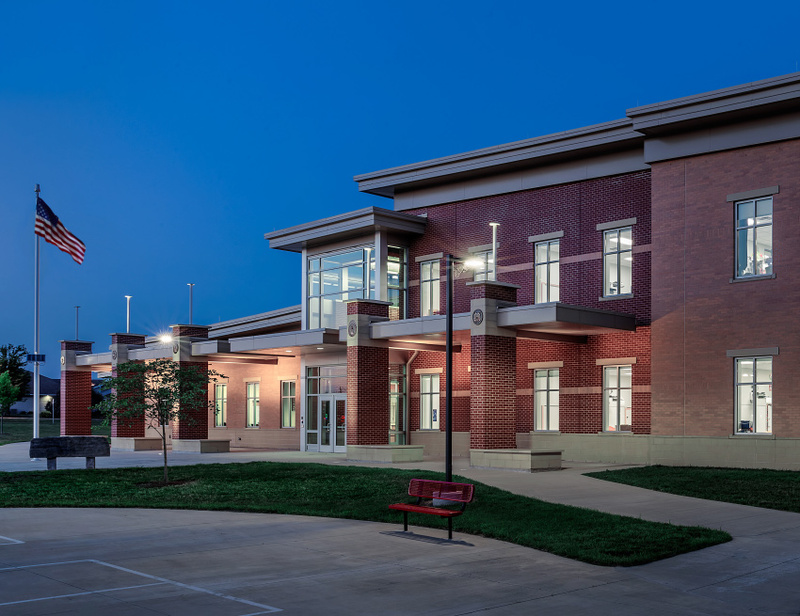 In areas where there are typically no connections to the outdoors, the Clinton Elementary School design challenges typical practice by providing direct visual connection to the exterior through windows at the ends of hallways and corridors. Interior walkways contain windows that overlook the sweeping, clerestory-lit two-story lobby, creating an open feel throughout the school. Connection to the outdoors, and natural light, are essential aspects of 21st Century education design. Natural light creates an atmosphere conducive to learning. It also improves a building's energy efficiency. At Clinton, natural light is not only featured in classrooms, but also in almost every area of the school, including the gymnasium and stairwells. Rapidly changing technological advances have changed learning environments from those that are strictly classroom-based, to those involving a variety of spaces. The new school provides many spaces for collaboration and activities outside the traditional classroom. Learning nooks inside and outside classrooms allow educators to create individualized learning experiences for each student. Clinton Elementary Principal Sacha Young notes, "Bringing our 2/3 and 4/5 buildings together in one location continues to prove to be a fantastic transition for both student and teachers alike." Superintendent of Clinton Schools Curt Nettles summarizes the benefits of the new design, "The new school provides the opportunity for all of our students in grades 2-5 to be in one place and enjoy the benefits of a unified system. Moving from two schools into one allows one staff to work with one set of administrators to provide a more focused path for students to meet learning standards. It also provides students the opportunity to a fresh new learning environment in a modern, state of the art facility with all of the best security features."